Gren is an unreleased walrus-like Bakugan. Gren resembles a walrus in Bakugan form, it has two huge horns to attack enemies. In the upper part of the head it has a red crest. It has a blue body with white stripes and yellow claws. There is a rumor that it evolves from Sabator. He's in the BakuSuper G Series. It has only been seen in Aquos and Pyrus so far. The Pyrus version has 1580 Gs. It will be released in November/December. 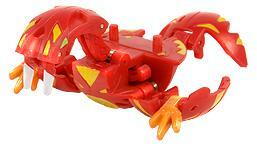 Purchase your Gren Bakugan from Amazon now!